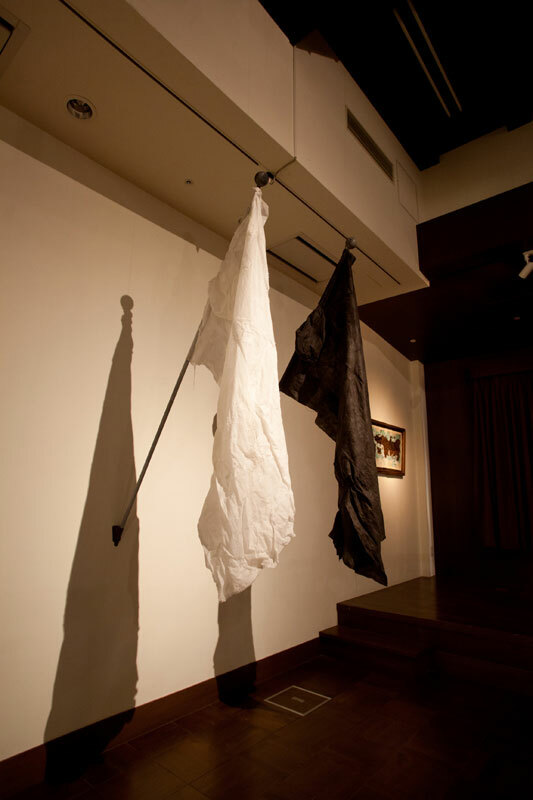 I made the protection suites into flags that are the same ratio of Japanese national flag, then dyed with the polluted seawater and soil. When 3.11 happened, I was in London. All of countries in the worlds were focused on news about Japan and Japanese government. My friends were worried about my family and friends in Japan, but when the nuclear power station broken in Fukushima, a friend said, “Japanese government is rubbish.” It exacerbated me like the revilement to my country, but it gave me the objective sight against Japanese government. At that time, people in Japan started the protests against nuclear energy and it gathered high attention from the public. After 2 years, I came back to Japan with a big anticipation to how Japanese artists react in this situation. However, not only the artists, but also people are not willing to mention about this topic and trying to forget the fact. I thought this is so ridiculous, and irresponsible to be unconcern about the government policy, even though Japanese government hasn’ t get any concrete idea to stop leaking polluted water that affect the natural environment in the world. I think that the amount of radiation in the air that government announcing is undependable, because even in the place where has too small amount to be detected, the radiation are carried away by wind or ocean current, and I believe the hole Japan is polluted. Thus I am using the word “polluted” in material. This work is the symbol of the current situation in Japan, the irony against Japanese government and the human technology killing human beings. I wish that the work provokes viewers anxiety by believing Fu×××××× in caption means Fukushima, and take a distance from the work. I hope that especially such a viewers reconsider about this problem.